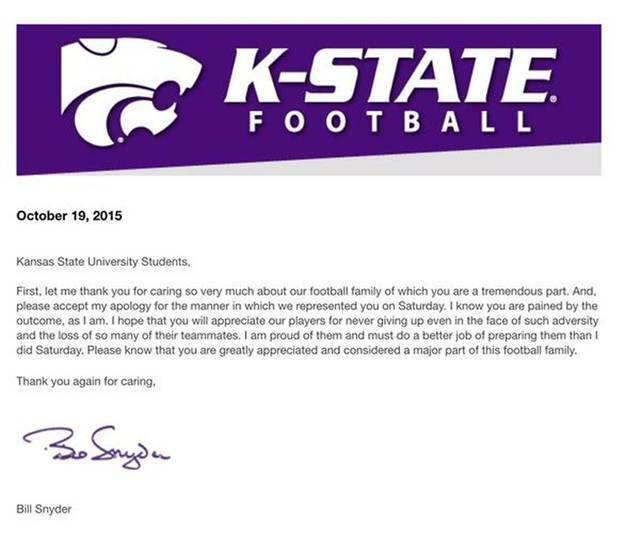 Bill Snyder is arguable the classiest man in college sports. After Kansas State got shelled against Oklahoma on Saturday, Snyder send the above letter to the K-State students via an email from the athletic department. Snyder’s letters have become a trophy of sorts in college football. Kansas State isn’t bad, and Snyder’s recruiting tactics are working as they always do. Snyder is one of the top coaches in college football history. Remember, he did bring Kansas State back from its label as the worst program in college football in 1988. With a chance to rebound against Texas, now, the Wildcats are on their way back to being at the top of the Big 12. If you’re a K-State fan reading this and saying, “Yeah, right,” just give it a couple years.